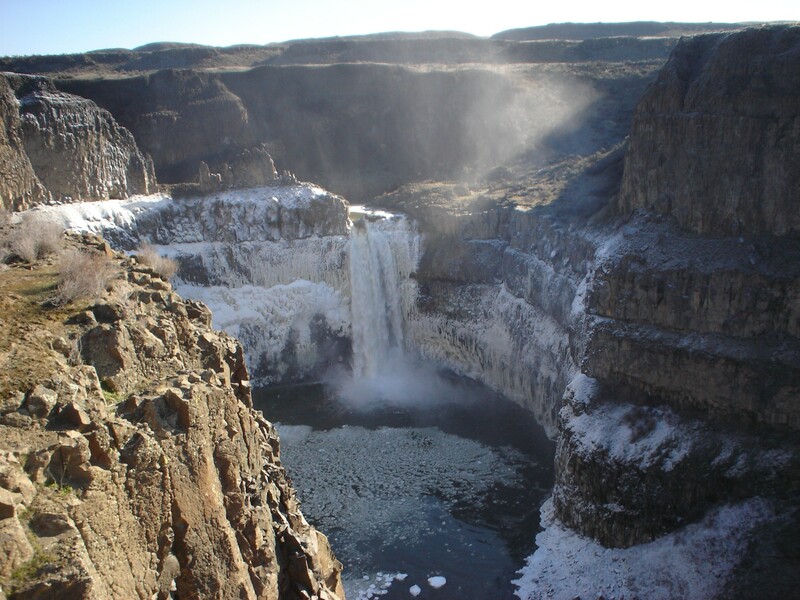 Visit Washington state’s official waterfall at Palouse Falls State Park for spectacular views like this one if you are an intermediate to experienced hiker and the winter weather is optimal. The South Sound offers some amazing opportunities to play outside for nature enthusiasts of all ages. Kayaking and paddle-boarding become a little less attractive as the rainy season descends upon the Pacific Northwest, but fortunately for we hikers, there are still some fantastic winter treks available. The great tragedy for those with a deep wanderlust? There aren’t many year-round hiking opportunities to help ramble away the wintertime blahs within a close driving distance of the Tacoma area. But there are a few. The South Sound Talk has covered great walkabouts before. The Tacoma Nature Center offers families a fun and sprawling park to explore, and many Tacomans know how to use Metro Parks Tacoma and other great online resources, such as Discover Parks, to zero in on family friendly walks at places like Snake Lake, Titlow Park, or Point Defiance. Nearby Spanaway Park is also vast, and there are many trails surrounding the grounds and lake at Bresemann Forest Park Trail that can be fun to explore in any weather. Wapato Parks are another great way to unwind outdoors without having to travel very far. If you already have a Discover Pass, you can experience winter wonderlands like this one for yourself at Lake Sylvia State Park. There are some other great trails in and around the South Sound that could be classified as more of a walk than a hike, ones that are ideal for families, dogs, and bikers. The Foothills Trail in Orting is a great example—this 25-mile stretch runs from Tacoma to Mount Rainier, and connects to the equally convenient and peaceful Riverwalk Trail bordering the Puyallup River. For those who like trail running, Wildwood Park in Puyallup offers a series of interconnected trails and circuit training equipment. All of these parks are accessible year-round, and are in most cases just a half hour drive outside of the Tacoma area. There are more than a handful of state parks that are dangerously close to home for those who are in the mood for a more sprawling expanse. Kopachuck State Park, for example, offers year-round hiking trails, as does Penrose Point, Millersylvania, and Flaming Geyser State Parks. The beauty of these nearby old-growth forests, marshlands, and beaches offers the outdoor aficionado a chance to explore the wilds of the South Sound alongside the convenience of parking areas, restrooms, and covered picnic shelters. For a more complete list of South Sound area state parks, the Washington State Parks website is very comprehensive. WSP’s blog, Adventure Awaits, is also an amazing resource for stir-crazy South Sounders looking to stretch their legs in the winter months. Snow-capped peaks in the distance stand as a silent cheering section for hikers. Push yourself to summit the same cliff formation that Lewis and Clark camped at while en route to the Pacific, which reaches a formidable elevation of 848 feet. For those with an itch that a paved pathway just won’t scratch, there are still some really great opportunities to take a hike out yonder. Just be sure to dress warm and gas up the ride, because many of Washington’s most scenic hikes are outside of the metro area. Finding the best and most idyllic adventure depends greatly on factors like hiking experience and available gear. The map below highlights some of this writer’s favorite spots to hike, most of which are available within a three hour drive, and are accessible year-round. While winter hiking might sound daunting at first, there are a few really great reasons to complete a scenic trail or two during the winter months. For one, popular trails aren’t so congested during the winter season. 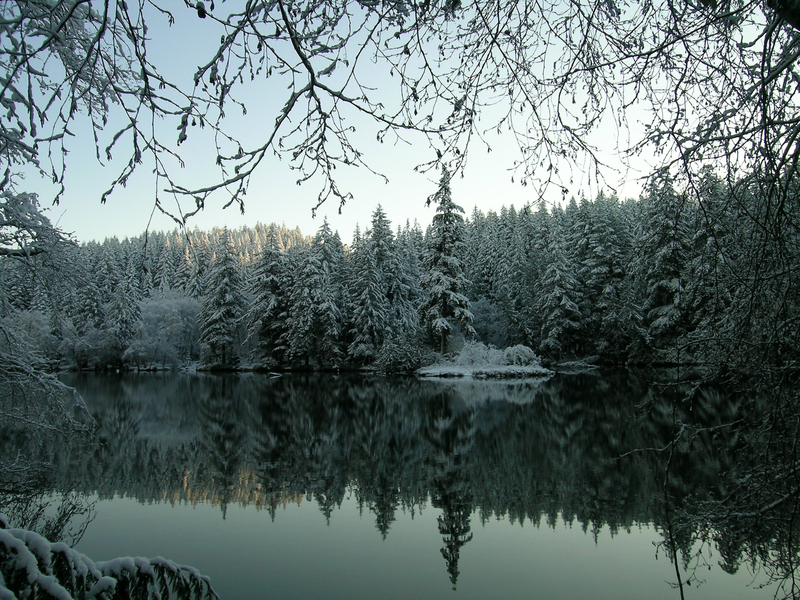 For nature lovers looking to decompress and revel in the sights and sounds of Washington’s trails and vistas, winter may well be the perfect time to do it. The flora and fauna are very different in Washington’s parks, forests, and shorelines during the winter. What makes a better selfie than a snowman backed up against an icicle-lined waterfall? In addition to fewer bugs (yea! ), the hibernation and migration patterns of animals in the region change with the seasons as well, making some otherwise familiar hikes a new experience altogether. 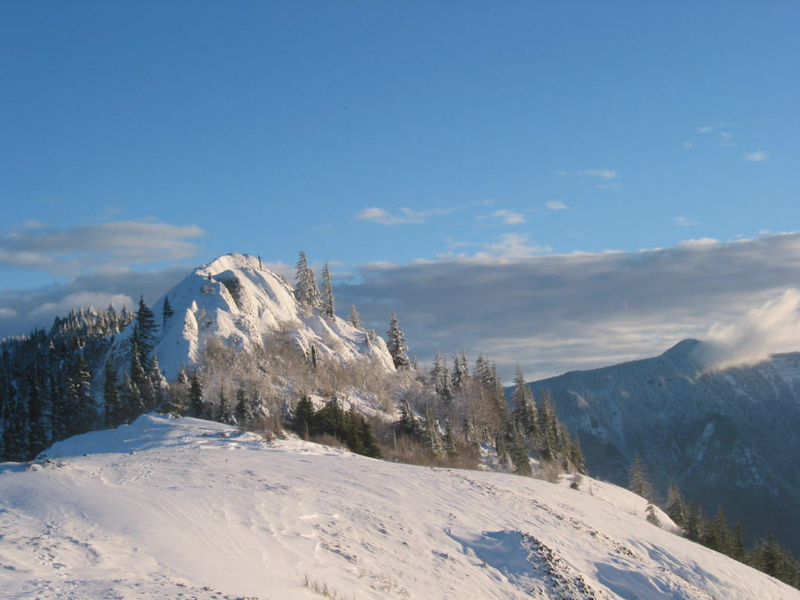 The Washington Trails Association’s Kindra Ramos reminds explorers that it’s very important, not just during winter hikes, but year-round, to be prepared on the trail. “Hikers should have the Ten Essentials (a topographic map, compass, extra food, extra clothing, firestarter, matches, sun protection, a pocket knife, first-aid kit, and flashlight), call the land manager to check trail conditions before they head out, and not let an itinerary push them further than they should safely go.” Kindra loves low elevation hikes near the river during winter, and recommends that hikers check out WTA’s trip reports to help select ideal or popular winter hikes. Using the advanced search functions, users can see where people were hiking last December – February, as well as what kind of trail conditions they encountered. 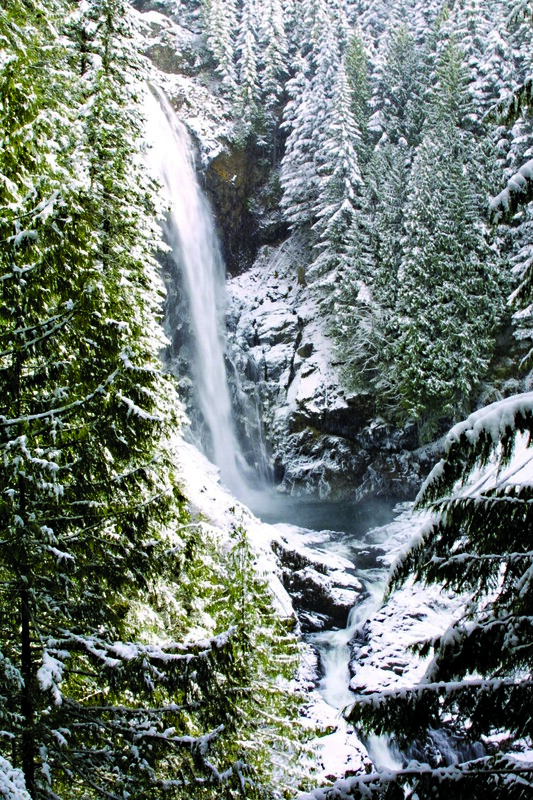 A state parks pass, some warm winter layers, and the ten essentials are all that’s standing between you and gorgeous scenes like this one at Wallace Falls State Park near Gold Bar. Anna Roth is the content coordinator at WTA, and she agrees that the hiking guides on WTA’s website are a great tool to help find hikes in the South Sound and beyond. Anna also suggests checking out some of the hikes on the higher level Puget Sound and Islands, as well as the Kitsap Peninsula, and the East side of the Olympic Peninsula. There are a number of scenic hikes listed on the accompanying map; these are color-coded based on their driving distance from the Tacoma area. For those hikers who aren’t above using a little mobile media to help locate that perfect trail on the road, Washington State Parks offers a mobile app called Pocket Ranger for Android and iOS smartphones. Some hikers find apps like All Trails helpful in navigating to or selecting a trail, as well as in uploading candid shots from their journey and chronicling their adventures. For families interested in geocaching, the official Geocaching app can also help guide players to sweet spots both in town and beyond the trailhead using GPS waypoints as bait. Many waypoints are placed in parks and areas of interest, which is how this writer often stumbles across new places to explore. This article originally appeared in the South Sound Talk November 10, 2014, and can be read here. This entry was posted in Outdoors and tagged Beacon Rock, Gig Harbor, hike, hiking, Lake Slyvia, lakes, Palouse Falls, Puyallup, snowshoeing, South Sound, Tacoma, trail running, Wallace Falls, Washington State Parks, Washington Trails Association, waterfalls. Bookmark the permalink.